So you might remember last year when we kooked up this idea with the Supersisters to team up to do some Guerrilla Goodness for the kids heading back to school? Well, this year, we have a special invitation for you?! We know our city is a little screwed up, well a lot, but would you like to do something kind for the kids of our city? Yes? Meet me and other Guerrilla Goodness lovers in front of the Carillon (Byrd Park) at 3:00 pm on September 7th! 1. 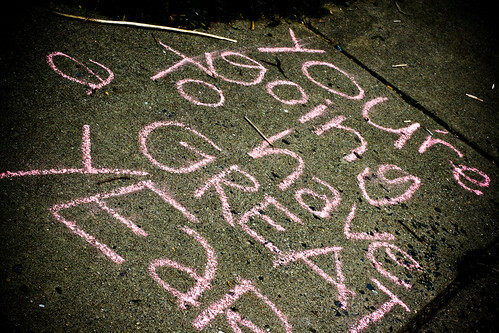 I will pass out addresses to city schools and sidewalk chalk. 2. 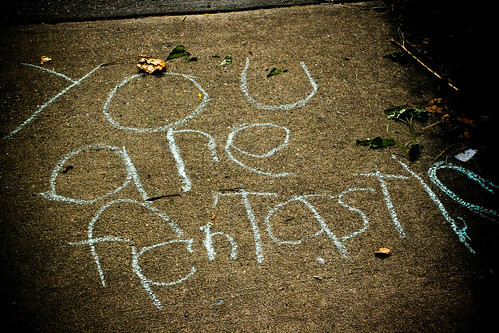 You head out with friends, family, kids, dogs, grandmothers, artists, whoever…and write positive messges to kids on the sidewalks in front of the elementary schools in Richmond city for the first day of school. 4. If you are kid, be super quiet when you are walking to school the next day and everyone around you is talking about the cool art out front. and smile. We are looking for graffiti, tattoo and other artists that might be interested in doing one crazy cool “square” at each school. All in chalk, of course. Please contact patience@kindnessgirl.com if you are interested in helping. Can’t wait to see you there. Leave a comment if you think you might like to come, or just show up. Please, tweet, facebook and blog this too! Thanks, it’s gonna be great! It’s simple things like this which make the most difference in people’s lives. A great idea for our children. I wish I could make it. Thank you! I am a teacher at a local Richmond city elementary school. Reading this brought tears to my eyes. Our children deserve to know they are special, and this is a WONDERFUL idea!! Love this idea! Maybe we’ll do this in Chicago! i like this – a lot! hope you have a wonderful day of goodness. This made me smile 🙂 It really is the little things that make such a big difference! Just knowing someone cares enough to stop and do something nice. Enjoy the outing! Okay girlfriend! You got me to jump on this band-wagon last year and it was a hit! We’re doin’ it again, too and I can’t wait. This time though, like yourself, I’m asking for volunteers to jump on this ‘Guerilla Kindness’ band wagon, west coast style, with me! We start school Sept. 2nd so we’ll be doin’ it on the evening of the 1st. I’ll share mine if you share yours! lol. Have tons ‘o fun!! Love this! Thanks for being the person who would think of this. I’m so there! I’ll spread the word! I’ll be there and also spread the word. But let’s not forget the private tuition-free schools that allow so many Richmond kids to even attend school- like St. Andrew’s School. A great school enabling children to dream and achieve the impossible. Yes! Maybe we can add them to the list? Great idea! this is so dear and inspiring! not long before I read this I made the decision to wrap some pieces of art that I want to move out of my studio and spread some guerilla kindness where i live. 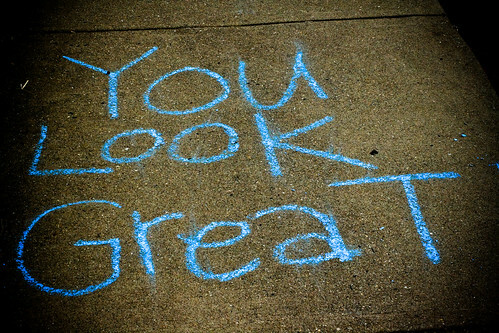 thank you, this is very affirming! Hi, Patience. I (and my 3 kids) are totally in~!! I may round up some teachers from my school too! Please include Blackwell Elementary on your list (oak grove too?) They are not w/in walking distance, but I can help caravan. Love you and fab. idea!!!!! I just found your blog and I just have to say wow, thank you for your inspiring radiance! I’m soooo going to do this at my daughter’s school for her fist day of Kindergarden. What an absolutely BEAUTIFUL idea! I LOVE this idea. I’m definitely going to hit up my two local schools. Have already sent word to neighborhood moms so our rising 6th graders will feel a little less afraid of starting a new school. I love this idea so much!!! This is a great idea, thank you kindnessgirl! I came across this website dreamer.me and I thought it was a great idea. Just make it your primary search engine and you’ll give hundreds per year to charity.. so easy! Patience…don’t know if you saw my reply…I will be coming w/ my children and at least 2 other teachers from my school – Blackwell. Didn’t know if that was one of the schools you planned on, but would it be okay – “add us to the list”. It is in the Manchester area. Oak Grove is close by too. what a great idea! i will try to make it out. Great idea Patience. Nice meeting you at the RIO party. After reading about this I knew I had to participate. My homeschooled children are going to our neighborhood school this year for Art, Music, Chorus and Gym. My husband and I surprised them and other neighborhood children with inspiring messages. My children were so excited to read each message along the route. We received a special thank you in our local newspaper a few days later. Thank you for this wonderful idea. Such a simple act that touched so many. Okay girlfriend! My blog post is up! Our Guerilla Goodness was fantastic this year!! I’m so touched by all that showed up. I can’t wait to hear all about yours and see your pics! I’m so excited for you!! You rock! If some of you are heading to Blackwell and Oak Grove…. Could you stop by Swansboro on the way? We would love a message to kick off the school year!!! Thanks!!!! hello from Australia, 2011. just ‘paste’n’posted this wonderful idea. Let the sunshine !